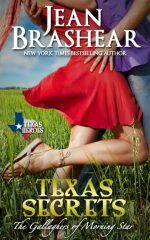 The first three books in the bestselling TEXAS HEROES romance series —small town love stories rich with emotion, ripe with secrets, scandals and sexual tension. Now the main characters in this tragedy are all gone, and in the wake of the final man’s last will and testament, the past has roared back with a vengeance. Secrets will be revealed and the lives of four people will be shattered as they learn that who they are and where they come from is not at all what they always believed. Texas Secrets: Former SEAL Boone Gallagher returns to the only home he’s ever known only to find that the ranch has been willed to a stranger who doesn’t want it–and he must keep her there for thirty days, or it will be lost to them both.